Tesla said it produced 2,425 Model 3s in the fourth quarter. Tesla is slowly ascending from its "production hell," but Wall Street is getting restless. The electric vehicle maker said it delivered 1,550 Model 3 sedans in the fourth quarter of 2017, up from 220 the previous quarter. Tesla also adjusted its timeline for its already-delayed goal of producing 5,000 vehicles a week from the first quarter of 2018 to the second quarter. "During [the fourth quarter], we made major progress addressing Model 3 bottlenecks, with our production rate increasing significantly towards the end of the quarter," the company said in a statement. Previously, CEO Elon Musk signaled that Tesla's launch of the vehicle would be difficult and described it as "production hell." 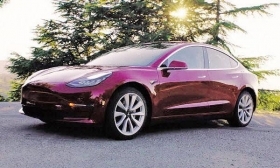 Production of Tesla's first mass-market car has attracted much attention, as reports detail supplier issues and assembly line delays while the company works through a reservation list at least 455,000 customers long. The automaker widely missed its third-quarter goal of delivering 1,500 Model 3s and now twice has pushed back its target of producing 5,000 vehicles a week. Tesla shares fell 2.1 percent in after-hours trading to $310.50 as of 6:07 pm ET. Tesla has been blowing through more than $1 billion in cash a quarter as it’s had trouble scaling up Model 3 output despite spending heavily on the robots, assembly lines and tooling needed to produce them. The car starts at $35,000 and is pivotal to Musk’s bet that mainstream consumers will buy battery-powered vehicles in droves once they become more affordable. The company initially planned to make 5,000 units a week by the end of last year. Analyst estimates for fourth-quarter deliveries were all over the map, as Tesla remained tight-lipped about its progress, with an average estimate of 2,917 vehicles, according to Bloomberg. Tesla said it produced 2,425 Model 3s in the fourth quarter, but production rates increased toward the end of the quarter -- to 1,000 vehicles a week. The automaker expects to hit a rate of 2,500 vehicles a week in the first quarter. The company also reported delivering 15,200 Model S sedans and 13,120 Model X crossovers. Tesla said it delivered 101,312 Model S and Model X vehicles in 2017, a 33 percent increase from the year before. Tesla entered the final quarter of 2017 with about $3.5 billion cash in hand and projected another $1 billion in capital expenditures during the closing months of the year. In postponing production plans, the company may also be deferring spending, said Jeff Osborne, an analyst at Cowen & Co. who has the equivalent of a sell rating on the shares. Osborne wrote in a report Tuesday that the carmaker may need to raise more capital in the first half of this year.